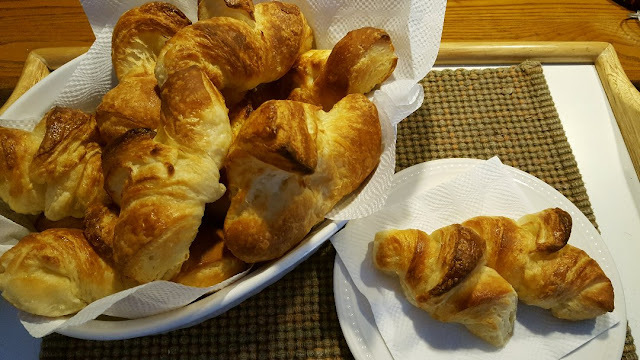 Rain's Garden: Homemade Croissants and Delicious Food! How was your weekend? Ours was cold and snowy, yeesh...check this out. 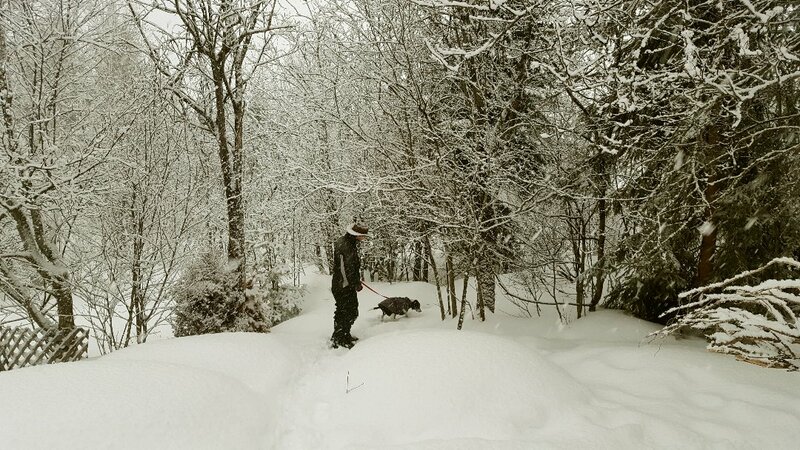 This is Alex taking Jack out on a snowy Saturday. April? Besides complaining about the snow, I baked like a champion this past weekend! I challenge myself weekly to try something new and yesterday it was Homemade Croissants. 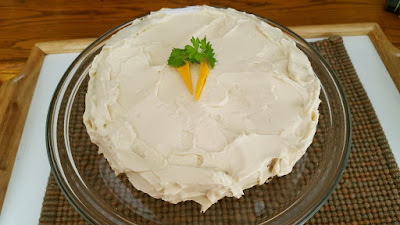 My Sunday food post is one day late...so much going on lately! 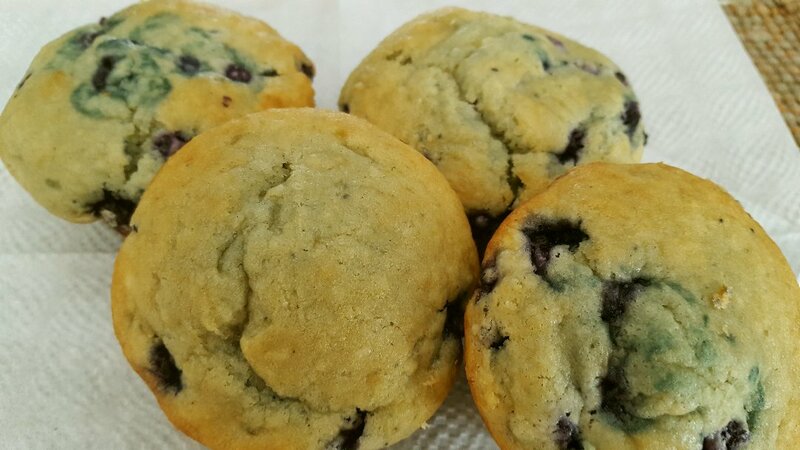 These turned out so delicious!!! 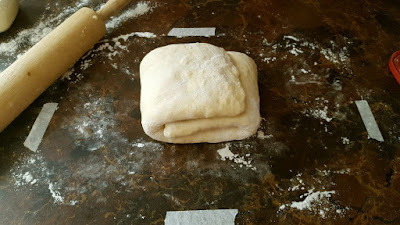 They are easy to make, but you need an entire day for them...from start to finish, these took 11 hours - not CONSTANTLY lol...there is just a lot of rolling, chilling and resting time in between each step! 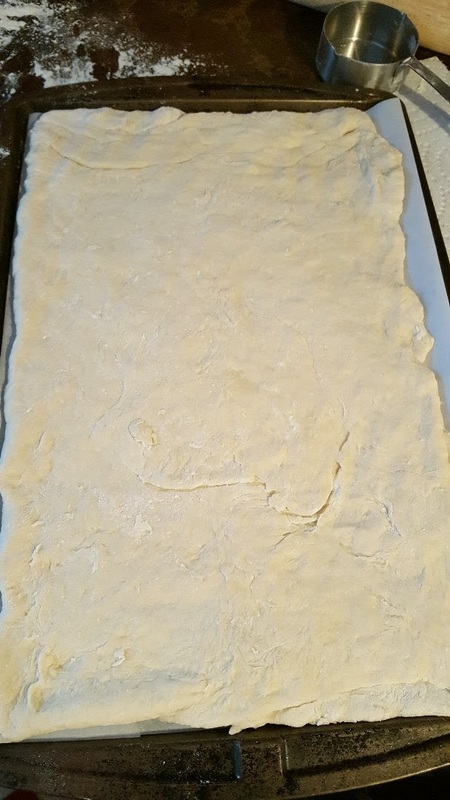 The first step is prepping the dough, then rolling it out and chilling it for 40 minutes. 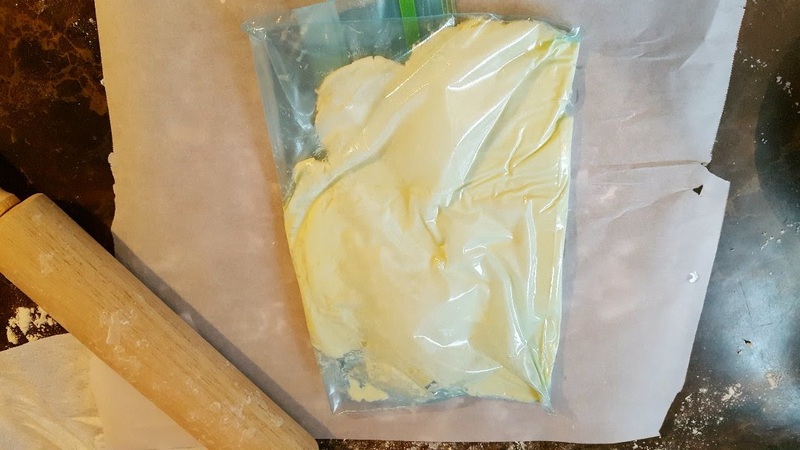 As your dough is chilling, you roll out your butter and chill that. 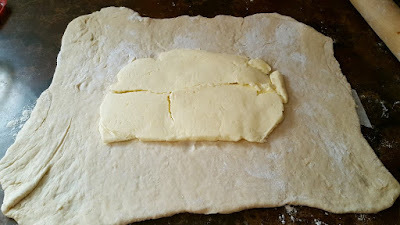 Then you plop your butter on top of the dough. 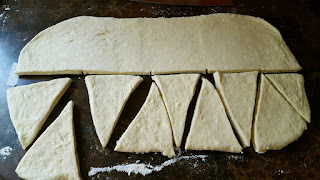 This next step is called the "lamination" step. Once you "envelope" your dough around the butter, you roll it out, then fold it up and chill for 45 minutes. You repeat this lamination step a total of 4 times, then chill the dough another 4 hours. See the masking tape? 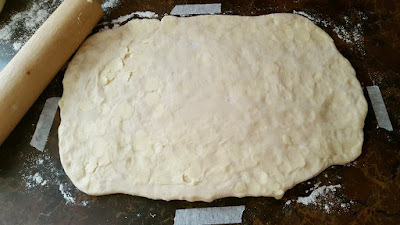 I use this as a guide for rolling out the size of my dough. After the 4 hours is up, you roll out your dough and cut it into triangles, make a little slit at the straight edge then roll your croissants. 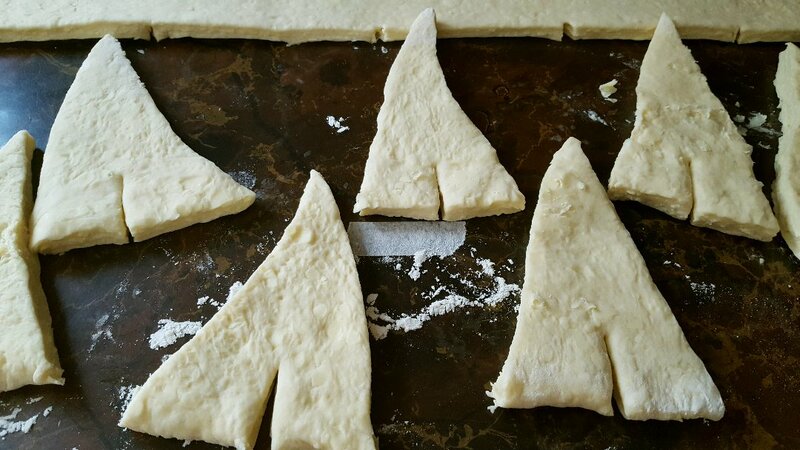 At this point they rest about 90 minutes before you bake them. (I have the full instructions on the link at the top). 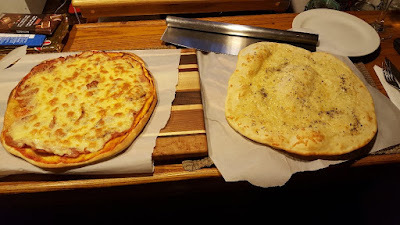 Some other dinners the last week were Chicken Piccata on a bed of Parm pasta; and Pizza Night with a ham and cheese pizza and a Bianca pizza (lovely pizza with a garlic-flavoured olive oil, a wee bit of Parm and Mozza, and some basil). The Bianca pizza is especially good using my thin crust Pizza Dough. 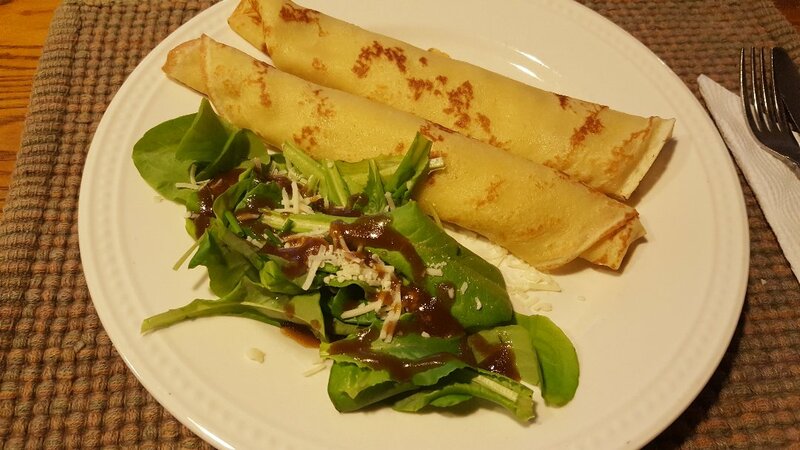 I also made Crepes and served some more of my homegrown window lettuce as a side! The dressing is just Balsamic vinegar with olive oil, some crushed garlic and S&P. You can't see it, but there is asparagus and some Swiss cheese in those crepes, they were delicious! Your food!!!! You are such a wonderful cook, you could do catering!!!! Sorry about the weather, but I suppose, you are pretty used to a long winter, where you live. Which doesn't make it any easier though! Jack is clearly striking his "Good dog! 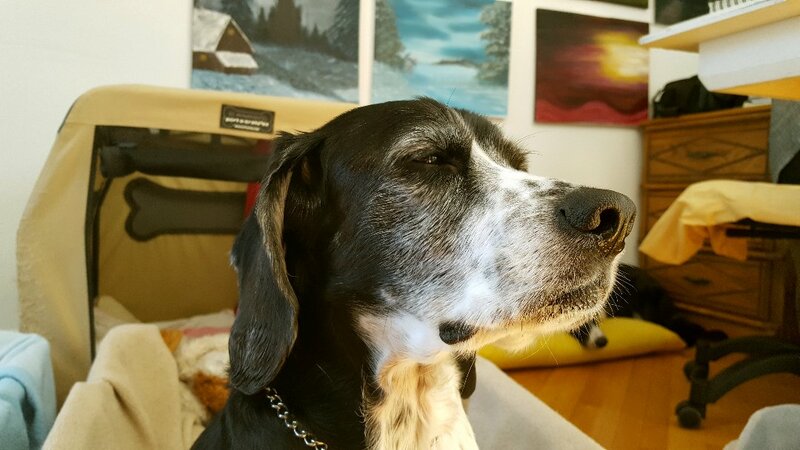 Noble dog!' look. YAY for Jack! Just look at him being all Hollywood...ignoring the camera! Can I get your autograph Jack? SVP?!? He sure is a handsome boy! Wow you did lots! 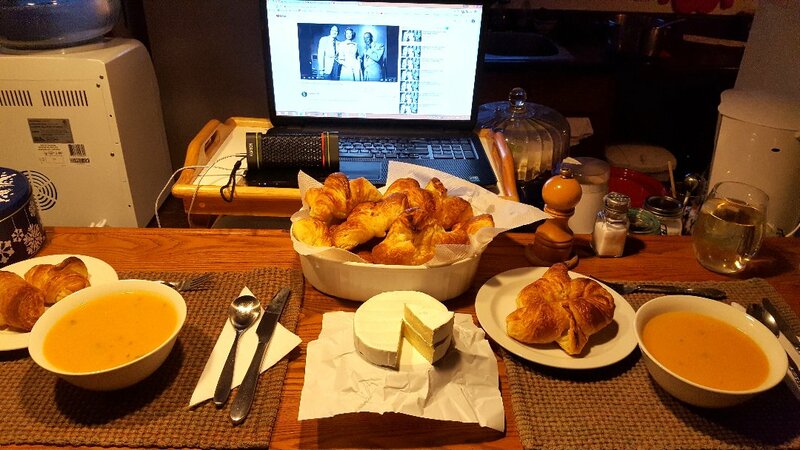 Those croissants look amazing! All your dishes this week look divine! Sorry about the snow. This has been a ridiculous spring. They are promising snow for us tonight, tomorrow and Wednesday. Why not? After all, how needs spring? I hope its not going to be a cold summer. I hate those. The food looks amazing. I haven't had crepes for a long time. My kids last made them. Yum. Jack is so handsome. I'm glad he's feeling better. Yes, this weather STINKS. I am starting to get panicky about my garden. I haven't made croissants in years - yours look fabulous! Your muffins reminded me that I have a tantalizing recipe from the Gluten Free Goddess for Blueberry Lemon GF muffins. And I happen to have about four gallon bags of frozen blueberries in the freezer! I didn't know you were on Instagram, so I am going to look you up!!! You are a good cook what else can I say, the croissants look so good! You fix food fit for royalty! It looks delicious - every single bit of it!!! LOL at Jack's photo. What a character he is. Glad he's doing well. I didn't know croissants were so much work! You did a good job. What a fun word, potage, is. I've never made that before. Thank you for the sweater love. I am very proud of it. It feels like such a big accomplishment! great jack news! 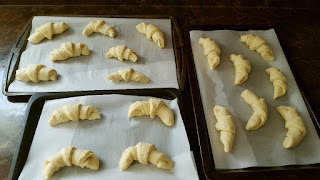 i haven't made croissants i ages. i have never been a fan of them but everyone else loves them. it snowed here all day and is going to be 84 degrees on friday. how can this possibly be!!!??? just too gross for words! i am so happy for Jack dear Rain and this is great that he will be more on ease after some days! 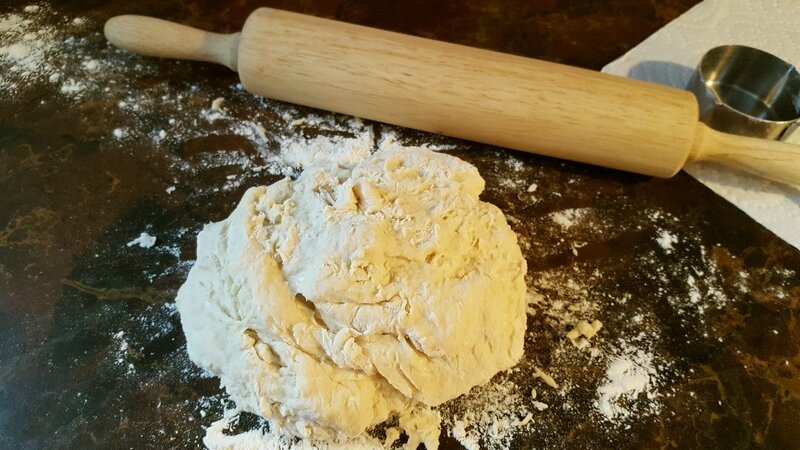 when it comes to praise your various talents i feel like "speechless"
I had no idea making croissants was such an involved and long process. They do look delicious, though. And so glad to read that Jack is more himself. He's funny acting all aloof like that. Cutie. Thank you for the love, Rain in today's comment. That is wonderful news about Jack! He is adorable and I'm so happy he's doing well. The countdown is on for him to be sprung from his 'safety' prison...haha... I bet he'll be thrilled! Oh this all looks so delicious! I'm hungry now! Now I will fall asleep hungry ... lol wow what a journey ... those croissants must have been the best ever. 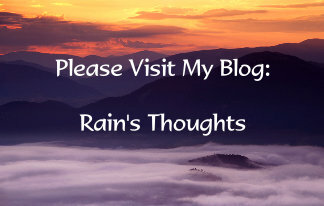 Rain, I'm breathless! Busy or what! Those croissants look delicious. It's great weather for baking while we wait... and wait... and wait for spring to behave itself and warm up. Love the photo of Jack looking hoity-toity. I'm so pleased that he's feeling better. So happy for Jack! Yes, he does know, he's a star! LOL! Wow, look at all your snow!! Holy!!! Thanks for all the yummy food!!! Looks amazing! Hi Rain. I'm Ivy a friend of Martha's and I came by to say hello. Love dogs, love food. Both are fun to have around. Love a good bake. 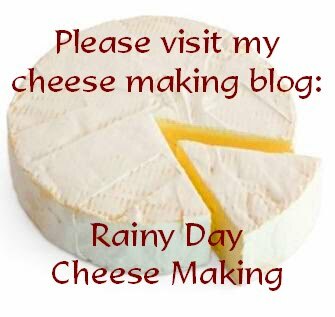 good news about Jack - I enjoy your blog and looking at all the food you make. Wow! Croissants are a lot of work! Not sure I'll be making them anytime soon...but mostly because of all the butter. I love butter but it's not good for me...not that much anyway! LOL! 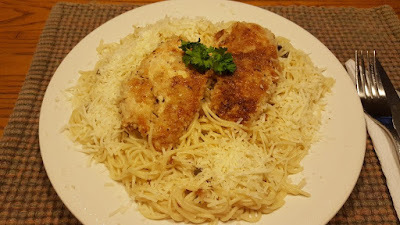 I do want to try your root vegetable pottage though and also the chicken piccata which I have never made. I'm also going to start growing a bunch of lettuce indoors! You've inspired me, as always! Thank you! Oh, and the carrot cake and muffins....yum!